Light on the Earth Systems is dedicated to assisting you with design and installation of solar energy systems. We provide consulting, education and pre-fabricated solar energy systems that are very durable and user-friendly. With thirty years of experience in the field, we can help you get a system that has very low maintenance and service requirements. Don't fall into the trap of purchasing solar from inexperienced firms who have little experience and sell systems that do not take maintenance and user-friendliness into account. Pre-fabricated solar energy systems provided by us have the most practical, compact design and use durable solid-state technology from the best manufacturers for long life and low maintenance. Easy to use and easy to understand, our systems are made to endure for 25+ years with minimal maintenance. Whether you are on or off the electric company power-grid, our systems can meet your energy needs more reliably and cost-effectively than any other system. 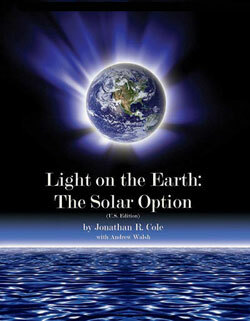 Contact Light On The Earth Systems today to start using energy the smart way, the solar way! In 1983 I moved to Hawaii with my family and purchased a couple of beautiful acres of land. The land was reasonably priced because it was nearly one mile from the electric company power-grid. At that time it would have cost over $25,000 to bring electric power to the property. Alternatively, I could create my own power system, which is what I did, for about half that price. My wife, who was not very technically capable, needed to have an energy system that would be very simple to understand and use. Myself, being very technically oriented, wanted a system that would require very little work for me to maintain and would be inexpensive to install and operate. So I set out to meet those goals and continue the development of that vision to this day, thirty years later. Much has changed since that time. Solar panels and the related equipment is more durable and lower cost. As a result, it is now possible, by selecting the best of the available components with the best warranties, to put together a solar energy system, that is far superior to grid power. Now you can have uninterruptible power with no blackouts or brownouts, power that is cleaner than the electric company can provide and whose costs, in the medium to long term, are a fraction of the costs charged by the electric company. However, to achieve this kind of solar freedom, the system has to be designed and constructed in the right way. Finding that right way has been the goal of our enterprise for almost 30 years and we have now reached our goal. What's left is to make sure the world can benefit from our 30 years of research and development. When you are ready for Solar Freedom, our prefabricated solar electric system, please contact us! If you want more information or are a do-it-yourselfer, please go to our web log. ©2012 Light On The Earth Systems, Hawaii, USA. All rights reserved.